Indian Sarsaparilla - Hemidesmus indicus - Magarbu or Anantmul. The herb is beneficial in leucorrhea, syphilis and other genitor urinary diseases. Indian sarsaparilla is useful for treating stomach disorders like dyspepsia and loss of appetite. The roots ground a paste with water and mixed with pepper is useful in stomach ache and diarrhea. Indian sarsaparilla contains a hair growing hormone. A decoction of the root is used as a hair wash to promote hair growth. 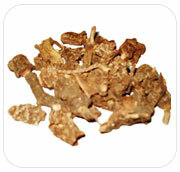 The herb is beneficial in leucorrhea, syphilis and other genitor urinary diseases. A decoction of its roots is to be administered in 60 to 90 ml doses thrice a day. Syrup made from its roots is an effective diuretic. A paste of its roots is applied locally in treating swelling, rheumatic joints and boils. The drug is effective is the treatment of fevers. Its diaphoretic properties, that is, sweat inducing properties; induce copious perspiration, thereby reducing the temperature. Good remedy for gout , epilepsy, insanity, chronic nervous diseases. It also effects nervous system. It cures intestinal gas, debility, impotence, turbid. It is a good blood-cleanser. Indian Sarsaparilla stimulates the production of sexual hormones. The root extract has antibacterial activity. In Ayurveda it goes by the name of ananthamoola or Anantmula. It is also called the False Sarsaparilla. The plant enjoys a status as tonic, alterative, demulcent, diaphoretic, diuretic and blood purifier. It is employed in nutritional disorders, syphilis, chronic rheumatism, gravel and other urinary diseases and skin affections. Indian sarsaparilla is a perennial twining or creeping herb with greenish flowers in small compact clusters and narrow cylindrical fruits. It has a woody fragrant rootstock, slender hairless stem and variable dark green leaves. The dried roots constitute the drug. On simple distillation with water, the roots yield a steroptency which is supposed to be a volatile acid. It also contains an essential oil. The odour of the drug is due to couumarin. The roots also contain resins, tannin and glycoside.